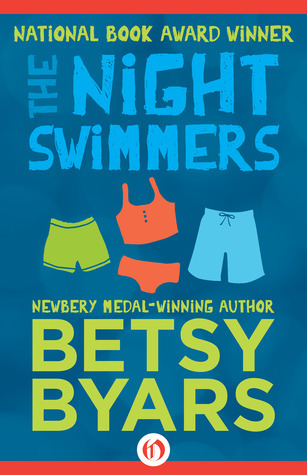 The Night Swimmers by Betsy Byars was the 1981 National Book Award winner for children's fiction. Retta's mother is dead, and her father, a country singer, works nights performing his music, so Retta is left home to tend to her two younger brothers, Johnny and Roy. Wanting them to have an exciting taste of the more affluent lifestyle she believes they deserve, she takes the boys swimming each night at a pool in another neighborhood. The kids are not supposed to use the pool, which belongs to the Captain, but Retta still feels somehow entitled to use it, as though it makes up for some miscalculation of the universe that allows her particular family to miss out on a chance at a better life. Retta goes to great lengths to make sure she and her brothers are safe, and that they never get caught, but it is only when one of them encounters real danger in the pool that things really start to improve for her family. I have mentioned before that I think Betsy Byars is a masterful writer, and this book just further proves that point for me. Like many other Byars stories, The Night Swimmers has a very small, contained setting populated by just a few characters. Since Byars is such a minimalist when it comes to the scale of her stories, she is able to spend much more effort (and text) on minor details. As this book unfolds, the reader begins to picture the house where Retta's family lives, the clothes they each wear, and the food they eat. The relationships between the characters come to life as Retta interacts with her dad, her brothers, and her father's girlfriend. Even the kids' relationship with their mother is described in such a way that the reader misses her along with them, even though she never directly appears in the story. Byars creates a small world, but it's a sympathetic one, and one with a strong emotional impact that lasts and lasts well past the end of the story. Also like many other Byars books, this one does not end with a neat resolution. There is always hope in a Byars story, and there is lots of it here, but the reader is still left to imagine the specifics of how things will turn out for Retta. The lack of a definite ending is very realistic, and it contributes to the feeling of authenticity and honesty that I have come to associate with Byars's writing. She lays out situations in her books, explores their problems and possibilities, hints at probable solutions, and then walks away, leaving the characters better off than when they started, but respecting their stories enough not to simplify or patronize them by providing all the answers. This recipe for storytelling shows that Byars respects children and expects them to be able to understand complex people and situations. I think that is what makes The Night Swimmers a special book, and why it still resonates with me today even though it was published before I was born.